In this quick tutorial you'll learn how to draw a House Fly in 7 easy steps - great for kids and novice artists. At the bottom you can read some interesting facts about the House Fly. 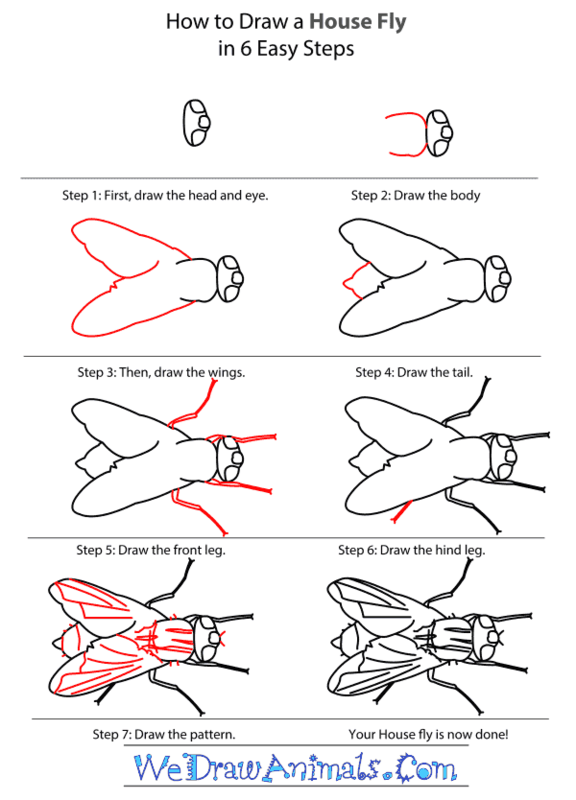 Step 1: First, draw the bean-shaped outline of the House Fly’s head. 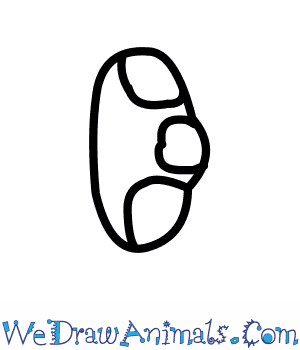 Draw two curves inside the outline for the eyes. Draw a small heart shape for the pattern between the eyes. 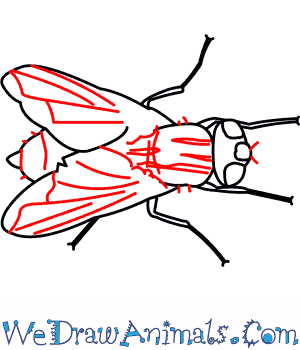 Step 2: Use two curved lines to draw the body of the fly. 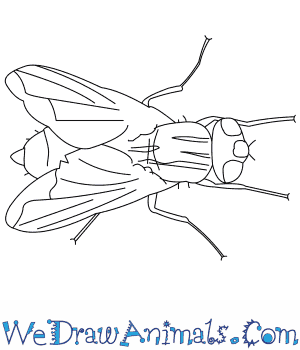 Step 3: Use gently slanting lines and curved lines to draw the outline of the House Fly’s wings. 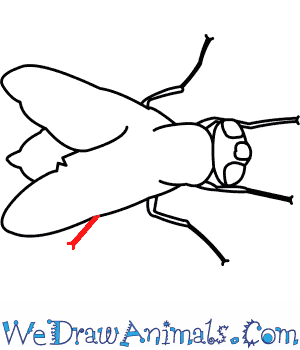 Step 4: Draw the V- shaped tail of the fly as shown in the image. Step 5: Draw the shorter front legs and the longer middle legs of the fly. The House Fly has jointed legs so draw a joint on each leg. 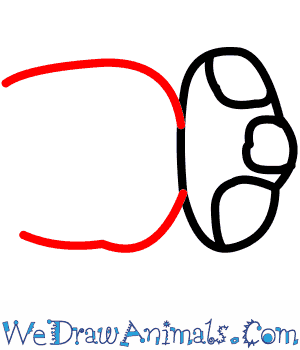 Use tiny lines to show the fly’s feet. Step 6: Draw a hind leg for the fly just like the other legs. 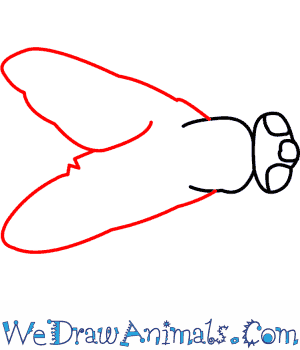 Step 7: Draw rough lines across the back, wings and tail to show the grooves on the fly’s body. Draw two short lines near the head for the antennae. After your drawing is complete, you can add color to it. The house fly is one of the most common insects in the world. Over ninety percent of the flies associated with humans are house flies. It is a small insect, only about six or seven millimeters in length, but it can have a great impact on the environment around it. The house fly’s Latin species name, domestica, means “having to do with the house”. Male and female house flies have faces that look different! Males have eyes that are close together, whereas the females have eyes that are far apart, with a stripe between the eyes. Male houseflies have a yellow-colored underside, but females do not. Up to twelve generations of house flies can be born in a single summer! There are over a hundred diseases than people can get because of house flies. House flies digest their food by vomiting on it first, which is pretty nasty. Even though many people think they are disgusting, house flies are actually very useful creatures in terms of scientific research. For example, forensic scientists use the pupae of house flies (maggots) to determine how long it has been since a person died if they find a decomposing human body. They are also helpful to scientists because their life cycle is so short (around twenty days) and they reproduce so quickly.